It's been quiet here on the blog for the last couple of months, but that doesn't mean we've been taking it easy. 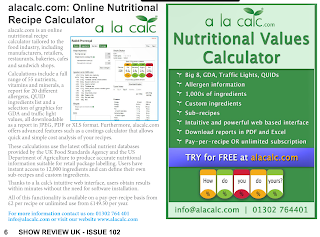 We've been chosen as a top 25 exhibitor from IFE13 back in March, and been working hard on some fantastic new features that will greatly improve the productivity of a la calc. 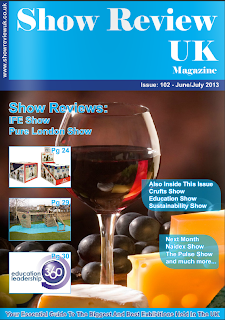 "With fantastic products and outstanding customer service these companies stood out from the crowd"
We're proud to have been selected as a top 25 exhibitor by Show Review UK Magazine in their June/July issue containing an 11-page review of IFE13. It is great to be acknowledged for having a unique and valuable service and we hope it will be the first of many more to come. As followers of this blog and customers of a la calc will know, we are always striving to improve and add to the already impressive list of features on offer. The last couple of months has not been any different. The first part of our next round of updates is the lifting of the beta of our US version of the website. This has already had a soft launch, but we are now ready to push this further. Next is a new layout for the view all Recipes page. We're implementing the groundwork for batch operations on multiple recipes e.g. downloading a single PDF/XLS containing multiple recipes or downloading multiple JPEG files at once without the need for opening each recipe individually. We're excited as to the future functionality of this page so stay tuned to this blog for further details. The creation of recipes and workflow leading to the Nutrition tab is going to be undergoing some streamlining changes too. The plan is to cut out unnecessary steps, clicks and page loads to make the process faster and more modern. Finally, we're completely rebuilding the Nutrition tab to make loading much faster. Our early tests have shown the page to load twice as fast as previously for a 10 ingredient recipe. We hope to get this down to an absolute minimum but still maintain the layout and variety of information available. The new build Nutrition tab will also herald a new set of functions that we'll reveal closer to the time of release. The new set of functions are aimed more towards our big users and but could also be invaluable to smaller users offering deeper insight and greater understanding of their recipes. Make sure you stay connected to this blog for the latest updates and when they're ready for you.